Hire John Malkovich For Your Child's Next Birthday Party! 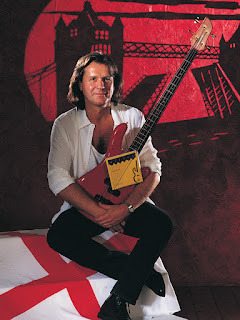 It was announced this morning that John Wetton passed away this morning. John was a music legend, playing in King Crimson, UK, ASIA and numerous other projects. As a teenager, I idolized John. He was the epitome of cool. The first two ASIA albums were played constantly in my bedroom. I wanted to be John. His voice was so powerful, his songs so moving. I followed his solo career as I got older and bought every CD of his that I could get my hands on. I was a frequent visitor to his official website and I had a blast (as many of his loyal fans did) of interacting with him on his guestbook. A dream came true when John reunited with the other three original members of ASIA in 2006. During a radio promotion for their upcoming tour, I called in a radio show in which the 4 gents were on live. John greeted me warmly. "Geno! I know who you are!". I felt like a 13 year old kid again. Such a silly moment, but one that's so important to me. I soon after saw my childhood hero play live in Boston. It was an unmatched joy seeing John with Geoff Downes, Steve Howe and Carl Palmer play live. John sounded amazing. The band was powerful. Joyful. John had many battles in his life. He had a public battle with alcohol. He beat that demon and emerged as a better man. He had heart surgery, which saved his life. His cancer battle in the final years of his life was brutal. John knew that I had my own battle with cancer and we bonded privately and publicly over our shared enemy, cancer. Slowly my hero became my brother. He knew that I understood exactly what he was going through. He never ever lost his sense of humor. He battled like a champion. Today's announcement isn't a shock. I knew John was struggling badly. But I am heartbroken. I have lost my brother in arms. John's music of course lives on. Here are just a handful of my favorite songs featuring John. I love you brother. Viola Davis: "art has to reflect life in our culture"